The monomyth known as the Hero’s Journey has become widely popular. Unfortunately, the original was clearly intended for men and not women. 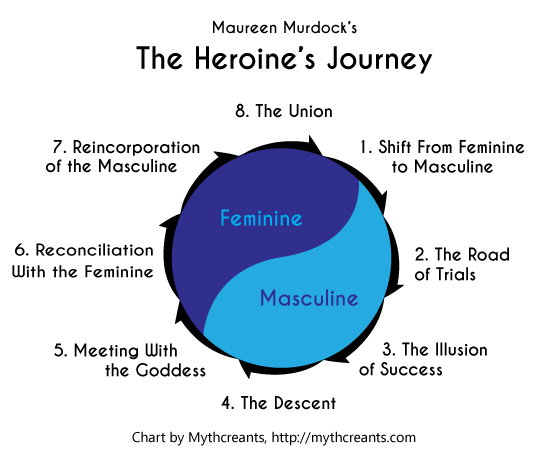 In response, some feminists have created their own, female-centered version, called the Heroine’s Journey. Lucky for us storytellers, both can be abstracted into a structure that works for a wide array of stories. I’ll take you through a tour of The Heroine’s Journey by Maureen Murdock. She created this journey to help real women through life’s hardships, but it has a lot to offer as a story structure. In honor of its feminist roots, I will refer to the central character as the heroine, with female pronouns. However, it applies to male characters just as well. To show you how it might work in a story, I’m going to develop an ongoing example. I’ll name my heroine Mara. As we go through the steps of the structure, she’ll ride beside us. Why Use the Heroine’s Journey? Character arcs: The stages of the original framework correlate with how the heroine feels, not what she is doing. I’ve externalized this framework, but it’s still a strong choice for a story about an internal struggle. Quests for identity: The heroine may battle dragons and claim treasure, but the real core of the story is her struggle to find herself. Themes of privilege and oppression: The heroine taking the journey must triumph despite living in a society that undervalues who she is. You don’t have to include privilege and oppression in your story, but if you want it, this framework will help you bring it out. Most of all, the Heroine’s Journey is about a heroine who must find balance as she struggles between the sides of a duality. First, identify the duality that lives within your heroine. It might be obvious. If you have a half elf, half human caught between those races, that’s clearly your duality. It can also be abstract concepts – perhaps your heroine’s caught between membership in a group and following her individual path. Or between the excitement of travel and the comforts of home. Whatever it is, both sides must be essential to her wellbeing. If you use the light side and the dark side of the Force, you’ll need to portray the dark side as constructive when used in moderation. The feminine is the side of the duality that your heroine identified with as a small child. However, society undervalues the feminine. The story begins as the heroine chooses to reject it. The masculine is the side of the duality that your heroine adopts as she comes of age. Society prizes the masculine, but in many tales it has been poisoned, misinterpreted, or taken to such extremes that it has become harmful. The heroine sets out on her journey by embracing it. Mara is a war orphan who was raised by the Sali people. They’re a peaceful farming culture that meditates every day and values quiet and contemplation. However, they’re a minority in the nation they live in. Their culture and society will be Mara’s feminine. Though they raised her, Mara is actually descended from a warrior culture, called the Barock. Once nomads, they’re now the ruling class. They will be her masculine. Here’s an overview of the stages of the journey. I lightly modified the stages from Murdock’s original structure to create a version that was easier for writers to follow. During stage one, the heroine rejects the feminine in favor of the masculine. She may still be tied to the feminine, but she increasingly resents that attachment. She could have any number of reasons for rejecting the feminine, but a unhappy relationship with a feminine role model, known as the mother, is chief among them. To the heroine, the mother represents the worst of the feminine end of her duality. She might be powerless, unhappy, flawed, or just interpreted that way. The mother is threatening to the heroine because she’s afraid of becoming her, just as Luke Skywalker fears becoming Darth Vader. Alternatively, the mother may be intimidating in her strength and perfection, particularly if you decide to make the feminine more privileged than the masculine in your story. The heroine may reject her to avoid feeling inadequate next to her. As she rejects the mother, the heroine will embrace a metaphorical father. The father represents whatever the heroine admires in the masculine. He may have a dark side, or be a despicable person altogether, but she isn’t aware of that yet. He opens to the door to a path that leads away from the mother, and makes the heroine feel like she could succeed on that path. In turn, she does her best to gain his attention and approval. He offers an escape from the mother, but at the same time he might rub in that the heroine is tied to the lowly feminine. He could praise her strength and brilliance as he tells her the feminine makes her weak and stupid. This will only spur her harder to prove herself in his eyes. As a result of this dynamic, the heroine discards the feminine, and any part of herself tied to it. Mara has no memory of before she came to live with the Sali. She is content to live with them until she turns twelve, and is allowed to go into town to trade at the market. There she learns that everyone thinks of the Sali as cowards, because they hide behind their walls when the swarm comes, instead of helping to protect everyone. She also meets the Barock. They look like her, and they appear powerful and confident. She’s curious about them; the older warriors humor her by showing her how to handle their weapons. But her Sali guardian doesn’t approve of the way Mara has begun to prize possessions she gained in the marketplace, or how she runs off to the market when she has nothing to trade. He forbids her from going to the market for a month, instead mandating regular meditation. This only makes her more determined to leave the Sali and join the Barock. In stage two, the heroine sets off on a journey, departing the ordinary of the feminine and fully embracing the masculine. This might mean she actually leaves home, sword in hand, or it could just mean that she abandons sewing classes and goes fishing instead. Regardless, she has something to prove to herself and others. In her new journey, she is surrounded by masculine allies. They still think she is less, or at least not one of them. In her heart, she believes they’re right. But that doesn’t mean she’ll give up. She’s fixated on showing everyone that they’re wrong. For that, she needs big victories. She wants something to show others, like a trophy or treasure. In pursuit of her prize she will face threshold guardians who try to deter her, and battle real or metaphorical monsters. In her enthusiastic pursuit of the masculine, she forgets to stay in touch with her inner self. All her actions are designed to make her look better to her masculine allies; she never does anything because she simply wants to do it. She’s always compensating for the feminine lurking within her. At sixteen Mara finally comes of age. She forgoes the Sali coming of age ceremony, and abruptly leaves to join a band of Barock warriors. She wants to help them protect others against the swarm. The group agreed to take her, but not all of them think it was wise. They’ve been training with weapons their entire lives, and their skill is superior to hers. So she trains day and night. Whenever there is a fight, she is out in front; no one can call her a coward. The mark of a great Barock warrior is the stinger of a swarm queen. She’s determined to capture one of her own. By stage three, the heroine has faced great trials and emerged victorious. She feels the thrill of success, and her confidence is bolstered by the applause of others. She has built an impressive, masculine reputation. But that does not dull her appetite for adventure and victory in masculine pursuits. On the contrary, as soon as she finds success on one quest, she immediately sets out on another. Her victories are never enough, so she tries to do more and more to distract herself. She must maintain the outside validation and applause that makes her feel justified as a person. Somewhere inside, she begins to realize that something is missing from her life. She feels stretched thin. She looks in the mirror, and isn’t sure she knows the person looking back. Even her victories seem empty. She counsels the great and powerful, but does not feel great and powerful herself. Mara collects her first queen stinger, and then another, and yet more. In her twentieth year, she destroys an entire swarm with a fire trap, and is hailed as the savior of the town. The Barock remark that she is remarkable despite her Sali upbringing, and she’s given a pass to watch as the High Council deliberates. But the stingers and praise feel small and trivial to her. They were too long in coming and too hard won. Mara spends her spare time pouring over her battle maps, devising new strategies to try against the swarm. She never stops to rest, because she doesn’t know what she would do with herself if she did. She is nothing without her endless hunt of the swarm. In stage four, tragedy strikes. It could be a cataclysm that shakes the world, or a private matter that no one else knows of. Regardless, she is suddenly made aware of what’s really important to her. When her allies come to usher her along on the next adventure, she turns them down. They tell her she is a coward. Or perhaps that she is selfish, impulsive, or whatever despised quality the masculine attributes to the feminine. But she doesn’t hear them. She is already far away, undergoing her own inner turmoil. She begins a period of voluntary isolation, descending into a metaphorical cave. There time passes slowly. It’s dark; there are no sights or sounds to distract her. There she searches for herself. She may have to sift through a maelstrom of emotions. Anger, remorse, and grief may all set upon her. She might be afraid to follow her thoughts and feelings to their conclusion, but she knows she must. Mara and her warriors are battling against a large swarm that is precariously close to a village. A lookout catches sight of the queen in the distance. There is just the barest of openings to pursue her. Mara takes it, leading a group after the queen. She succeeds, but on her return, Mara finds her departure opened a breach in the defense. As a result, a nearby Sali settlement was overrun, killing everyone inside. The old memories of being in the Sali come back to her and she weeps over the fallen. She tells her warriors to move on, but she stays to bury every one of them. The Barock think she’s lost her nerve, but they eventually leave. She continues her work alone. The heroine begins stage five in her darkest hour. But she is rewarded for her struggle when she encounters the goddess. The goddess symbolizes the true nature of the feminine, and the best of what the heroine left behind. The goddess imparts a great truth to the heroine about herself and the feminine. When the heroine parts with the goddess, she feels reborn. Mara spends weeks burying the fallen. She leaves the destroyed settlement, but does not return to the Barock. Instead she wanders aimlessly. Then Mara sees an old Sali city, abandoned since the invasion of the Barock long ago. She goes there and walks through what’s left of the ancient Sali temples and streets. Everything is familiar from her childhood, yet greater than it. She is filled with nostalgia and wonder. She remembers the happy days in her Sali settlement, and begins to miss it. She is perplexed by how open the city is. It has no walls to block out the swarm. The only thing marking the city borders are enormous braziers. She can only conclude that before the Barock came, the Sali did not struggle against the swarm like they do now. In stage 6, the heroine heads back to the familiar surroundings she left behind. She finds and nurtures her inner child, the part of her left from before she rejected the feminine. She may seek to bond with the mother, and to gain new understanding about her. She spends her time on simple tasks of a feminine nature. She receives no glory for her toil. Former allies find her and try to convince her to return to the way she was before her descent. Even the mother or others of the feminine may not welcome her back, remembering her rejection of them with bitterness. But she continues her humble work. She maintains hope that if she continues down the path that feels right to her, she will be redeemed. She waits patiently for improvement. Mara returns to the settlement she was raised in. They tell her she is not a member of the Sali, because she did not undergo the coming of age rite of their people. But she refuses to go. She sits on their steps and fasts until they allow her to work the land beside them. She speaks with childhood friends, but they hesitate to socialize with her. Her Barock warriors find her there. They tell her to get herself together and come back with them. She refuses. They warn her there is a swarm that is coming soon. She says she has other, more important work. Slowly, the Sali begin to trust her again. She undergoes the coming of age ceremony she missed. In stage seven, a crisis erupts in the realm of the feminine. In dealing with this crisis, the heroine once again faces the masculine side of herself, ready to emerge and dominate. She now understands the inner need that the masculine fulfills, and why she lost herself in it before. She recognizes that while the masculine was not her true goal, it was an important part of her journey. And she refuses to let it take control. Instead, she channels her masculine impulses to positive ends. She solves the crisis with serenity and grace. When it is over, she asks for no rewards. There is a weakness in the wall around the Sali settlement. When the swarm comes it breaks and they leak through. Mara does not have her sword, so she grabs a staff and runs out to fight them. She blocks the opening in the wall, allowing the Sali to fall back and reach safety. She is tempted to continuing fighting, to see if she can outlast the swarm. But the Sali call her to retreat behind the next wall. They will survive without the crops the swarm will destroy. She listens, and retreats. By stage 8, the heroine has found balance between the feminine and the masculine. But she is not finished until she helps others find that balance as well. She uses her synergy of the feminine and masculine to bring everyone, on either side, together. If they are embattled by a great enemy, her leadership guides them to victory. If it fits your story, this is also the time to discard your duality altogether. The heroine could reveal that it is false, arbitrary, or destructive. With permission from the Sali leaders, Mara acquires a new set of weapons. They are not flashy, but functional. However, she does not think that simply cutting down the swarm is the answer. The Sali traditionally burn a special incense when the swarm comes, but only inside because it’s not allowed elsewhere. She thinks this incense repels the swarm, and that is how the Sali used to survive before the Barock came. Mara convinces the Barock leaders of the town to try it. The Sali gather the ingredients for the incense in large quantities, and prepare bonfires. Because there are no large and protected braziers to burn it in, Barock warriors must protect the fires from the swarm when it comes, or the creatures might put them out too quickly to have an effect. The swarm comes, grouping together and rushing at the fires. The warriors stay firm. Soon, the whole area is filled with the fumes from the incense. The swarm weakens and retreats. The town is completely undamaged. The town leaders mandate the construction of large braziers immediately afterwards. The Sali and Barock design and build them together. If you’re a structure-phile who’s been wondering this whole time whether your story could be both a hero’s and a heroine’s journey, your answer is “yes!” Mara just did it. Because the hero’s journey focuses on external struggle, and the heroine’s journey focuses on internal struggle, they have a lot to offer each other. It’s important to remember that the Heroine’s and Hero’s Journeys aren’t recipes that should be followed precisely. Don’t add a literal goddess to your scifi story just because the Heroine’s Journey has a goddess stage. Instead, find a world-appropriate story element that symbolizes truth, and use that. It’s these larger, more general concepts that make the structures strong. Use them to find meaning and inspiration for your story, and bring them out. If breaking the rules of the journey makes your story feel stronger to you, do it. I read Joseph Campbell’s Hero with a Thousand Faces and studied the Hero’s Journey many years ago. I even applied it to some short stories… and found the formula came automatically sometimes – not surprising as it is ingrained in us. The Heroine’s Journey is a refreshing addition that will really help my writing. Thank you. Dang. I thought this said “Hermione.” (The obsession deepens!) Seriously, though, wonderful addition. This is extremely helpful. Thanks. If the goddess is the Eternal Female or Eternal Mother for a hero experiencing a divisive binary of abandoned feminine versus overvalued masculine, and the goddess for Mara is the archetypal or eternal Sali as embodied by the Sali village she discovered, then if your aforementioned half-elf were two brothers, one of whom despised his inner elvishness after living among humans and the other of whom despised his human half after living among elves, would the goddess for the former be the Eternal Aelfre (perhaps a guest starring appearance by Galadriel?) while the goddess for the latter brother might be an archetypal embodiment of humanity (this time with Aragorn as guest star?) — have I got it? I think you’ve got it But for storytelling purposes, the way they embody the feminine isn’t as important as their ability to impart truth and guidance to the heroine. A goddess that technically has nothing to do with the feminine, but nonetheless acts as a catalyst that makes the heroine think about herself and her relationship to the feminine would work too. This is incredibly fascinating. I didn’t realize it until reading this post that the heroines of my novels have this sort of journey as well—certain aspects rang true for me. Thanks for sharing. I found this to be amazingly helpful. I especially agree with having to reconcile the feminine with the masculine to find a balance instead of abandoning one for the other. Thanks for this amazing introduction! Inspired my writing too. When I search the other information of the Heroine’s Journey, I found there are some different steps with your version. Like they would have ten steps more than your eight steps. I wonder what’s the difference between it? Could you explain more about this? Thanks a lot! The Hero’s Journey was made famous by one, really popular book, so everyone agrees what structure we’re talking about when we say “The Hero’s Journey.” But this is not the case with the Heroine’s Journey. I personally know of two independently derived structures, one by Maureen Murdock (the one I am using), and one by Valerie Frankel. In addition, when someone discusses it, they could just as easily be talking about their own idea of what the Heroine’s Journey is. So when you search for information, you could get a variety of frameworks. My goal was to provide a structure that would be useful to storytellers. I thought the Valerie Frankel version was too similar to the Hero’s Journey to offer something new, and bogged down in specifics that would be more restrictive than helpful. Even though the Murdock framework was meant to guide women in real life, and not as a story structure, I found it very useful. However, even when looking at other summaries of the Murdock version, you’ll still see stages that are a bit different than mine. Her stages weren’t meant for writers, and so I did a little adaptation to make them work better for that purpose. For instance, a story structure always presents events that happen in sequence, one after the other. But Murdock’s first two stages, “Separation from the feminine” and “Identification with the masculine”, would happen simultaneously in a story. So I combined them into Shift From Feminine to Masculine. I also combined “Urgent yearning to reconnect with the feminine” and “Healing the mother/daughter split” into Reconciliation With the Feminine for pretty much the same reason. I hope that answers your question. I’m glad you found my summary useful! Thank you for this. Until this article I’d never even considered that the heroine got a separate journey. The hero male or female has been to me a sacrificial figure,a tool that a community employs in defenses against existential threats. This will be helpful to me in decrypting something that has been on my mind for some time,the Female Power. The often maligned Male Power fantasy is at the heart of the Hero’s Journey and can be distilled into a single sentence. Overcoming adversity and being rewarded for having done so. Hi Chis! Thanks for writing this! Like Whitney, I have female characters who have been, blindly, following these steps. Both though have reached a point where I have been stuck trying to transition them from destructive behaviors. Reading through your article illustrates where I am stuck with each. One at the Illusion of Success, and the other Meeting with the Goddess. The stages you’ve given here have already given me the insights to see where I’ve failed to do the characters justice. Again, thank you very much for sharing your insight. Excellent! I’m glad I could help. Yes! I found out about Maureen Murdock by way of Christopher Vogler. When I looked carefully at the stages, I found it fit Kurt Wimmer’s Equilibrium and the character of John Preston very well. It fit Campbell’s overt steps, but it really fit like a glove when I included Murdock’s inner path. John Preston turning from highest ranking Tetragrammaton Cleric to Champion of the Resistance brought Reintegration of the Masculine. I have blogged about it at some length, if you are interested in reading. The stages are separate posts- each one has a link to the next. Very interesting article, it is good and refreshing to see alternatives to the Hero’s Journey, i also like the contrast between them as one is mostly external and the other is mostly internal like you said. I also think that despite the gender specific naming either of them could work with a male hero or female heroine depending on the story and character, and it gets even better if we use elements from both for the development of a single specific character, and you are right .. The elements of these “Journeys” are merely guidelines not to be taken literally, also not all of them have to be used nor do they even have to happen in the same exact order in every story. Thanks for writing this detailed analysis of the Heroine’s Journey and i have to say i did enjoy Mara’s story even if it was just an example, keep it up Chris. Its a recent book and probably, IMO, a better version of Maureen Murdock’s (I actually read her book and I thought it was dated). Frankel’s book seems more interesting and explains that the Heroine’s Journey is much more complex than we expected. The Hero’s Journey, Cosmogonic Cycle, and Monomyth applies to both men and women because it applies to “Human Beings.” To say that the Hero’s Journey is not intended for women is to misunderstand its purpose. The desire to create a more modern, 3rd wave feminized, or woo woo filled approach isn’t all that helpful, but the claim that the original is lacking is just not correct. The man who came up with our modern interpretation of this was a genius who worked decades to understand it. Slapping together some derivative goddess stuff is not the same. Campbell himself isn’t with you there. To him, women were stages, not journeyers. Perhaps because he looked out a lot for classic myths which usually have a male hero and only incorporate women as the backdrop. Or perhaps he couldn’t imagine female heroes because of his upbringing and his surroundings. The fact that one person writing about something left out part of the possibilities doesn’t mean they don’t exist. There’s nothing special to this. It’s still the Hero’s Journey (something done to death to begin with), but given a feminist slant. I’m hoping for Finn to have an arc like this in the Star Wars films. While it’s a little weird to see the First Order as the feminine, I suppose it was mostly represented for him through a female political officer. But he leaves it, abandons its values – including being a fighter (he just wants to run) or standing for something beyond himself (he just wants to survive). His escape is a road of trials, and pretence to be a resistance fighter and passage on that freighter an illusion of success. Rey and Maz together could be the goddess in this schema, as they start to show him reasons to fight or stand again. Right now he’s in his descent (out of order, yes). When he recovers, I assume he’ll be fighting for the Resistance, for sake of people like himself, like Rey, and like the people from the village on Jakku – that’s the masculine and the feminine, as he uses what the First Order taught him against it. And I’m hoping he’ll get a Union by inspiring and leading a faction of stormtroopers in rebellion. This was really helpful! I’m trying to write more stories with female main characters, and I have a habit of making them sort of pushovers. I just have a question to help me use this to help me finish an outline. How do you create duality in the heroine? I usually just make them blank slates at the beginning to be pushed into the adventure, For example, an MC named Tsuki has the ability to obtain a different power each day, replacing the old one as it becomes stronger. In her world it makes the #1 ability user. She has no conflict since people don’t know of this ability and has no feminine or masculine side to go after. This framework is about an internal struggle, so you’ll need to give her one. I think you’ll find that once you do, your story is stronger for it. If your main character has a personal problem at the beginning, you can solve it during your story. Give her room to grow into a better person. For the heroine’s journey, the easiest way to add a duality is to make the heroine feel divided between two paths she can take in her life. Maybe she can’t decide whether she wants to be a priestess or a warrior, or if she wants to wander with the nomads or live in comfort with the ruling class. She could be divided about her profession, cultural identity, lifestyle, or what type of person she wants to be. Making one of her parents represent one of the these options and the other parent embody the other is an easy way to bring the duality to life. So if she’s divided between being a warrior and a priestess, you can make her mother a warrior and her father a priest. You can’t leave her blank for this, she needs fears and desires. At the beginning she should desire the glory that comes with the masculine side of this duality (assign the masculine to whichever life path is glorified more) and increasingly fear or resent the feminine path she followed when she was young (assign the feminine to whichever life path people might look down on). If you have that, you should be able to follow the rest of the structure. Yes, the heroine’s journey is more internal than than external. But nothing says you have to make you female characters do the heroine’s journey or male characters the hero’s journey. Several of both groups criss cross. The blank hero? That suits more the hero’s journey. One bit of advice I’d give you is write a male character but change the pronouns. From the sound of it, your preconceptions are getting in the way, so write a male character and change the gender and see how the character feels. Sometimes, an old trope for one gender may not be for the other because it is so rare to see. That said: some ideas if you really want the heroine’s journey: Masculine: Her Powers Feminine: Those with few powers but other skills. I would say your hero sounds a bit strong if she can have any power and if she gets more powerful everyday, sounds like she’d make a better villain since it seems so big. But you can have her alternate between two powers every day or every 12 hours (when the sun rises or sets) and go between being weak and strong. The weak power should have a larger use than combat and that can be her duality? It’s very wee hours and I feel like my eyes have been opened by this article/literally everything on this site. Brilliantly written, definitely will come back to it. This got me thinking about one of my characters who is from a very rural society that raises the first child as traditionally masculine regardless of whether it’s a son or a daughter, and if it’s a firstborn girl she can choose whether or not she remains what she was brought up as and the head of the family after her father’s passing or steps down in favor of her brother if she gets one, and usually those ‘firstborn’ girls are very respected because they are seen as “one of us” by both men and women (in retrospect, it may not be as well developed as I think it is but hey in my defense at least in other places they’re looked at strange and shunned because urgh, weirdo). She’s embracing the masculine, nurturing protector role in her peaceful village, but can that very ‘nurturing protector’ be taken as the ‘feminine’ in the context of this article? Especially since it’s in her journey to become a soldier and learn to destroy? The feminine and masculine can really be any priorities that conflict. So if she’s a nurturing protector of her village, and then she leaves to become a soldier, the protector could be her feminine, and the soldier could be her masculine. It does work a little better if the masculine is the more glorified trait, and it sounds like in your story, being the village protector is an honored position. However, she just needs a reason to embrace the masculine that isn’t necessarily the right one. For instance, maybe being the protector of her village is a lot of hard work, and then she abandons her village to join the army so she can get revenge for the loss of a loved one. Then later she could realize her thirst for revenge can’t be quenched, and it’s time to give it up and go back to the duty she abandoned. You can definitely make it work. Glad you’re enjoying the site! Good luck with your story. Suffice to say this was a grand analyse to read, I really loved how you worked in an actual story outline for Mara to help demonstrate your points. Mara’s story actually sounds really cool, if you start writing/publishing it in full, then awesome! Weirdly some part of me found more than a few segments comparing to what I know of Luke Skywalker’s arcs, but only some segments. I seriously love how you broke down the differences as being the external and the internal and how that influences the story. Similarly the idea of duality and how its about finding balance or casting off the idea of duality entirely is great as it allows for great freedom while still providing a solid guide. Great post, but l cant help but thinking of something. I still dont understand why a female MUST unite her feminine and masculine side. Why cant she stay a warrior as it is and proud of it? (rewards etc). A male would go through this journey, too?maybe that’s who they are, their identity. I agree, there is some stereotyping in the heroine’s journey. Question #1 is why a heroine with feminine talents needs to discover her masculine side and push the feminine one aside. That suggests a woman can’t be successful by being only a woman and every woman would completely forego her feminine side to achieve success, instead of trying to merge both. Question #2 is why the masculine side can’t be a success on its own. If a woman strives to be a warrior, why can’t she just be a warrior, but has to reconciliate with her female side? Why does she, in essence, have to be warrior and mother, instead of just a warrior? So as this is applied to stories, the feminine and masculine are just symbolic, the structure doesn’t require the heroine to have any struggle between feminine and masculine at all. Using the structure only requires that the heroine finds balance between two extremes of some kind. If that’s not the right thing for your story, you’ll want to choose a different plot framework. This is not intended to fit every story. The real life context that shapes why feminine and masculine are the symbols used has to do with the real imbalance of power between them. Our society takes masculinity to the point of being toxic and looks down on anything feminine because it is feminine, and that puts pressure on real life women to adopt masculine traits in order to succeed. The structure was taken from the experiences of those women, and how they have dealt with that pressure. While not every woman will have the same experience, there is a real life disparity that this is responding to. I feel like you’ve got a fundamental misunderstanding of this. That sort of thing is not suggested anywhere, and the heroine’s journey is, as Chris said, molded after real life experiences of women’s struggle to reconcile what they were raised to be and what they realized they needed to be in this world. I think it bears to say that it also rings true of the stories of people who abandon one ideology in favor of the other – when they go too much with the other one, trying to compensate for a perceived shortcoming, until they settle and find a balance between what they chose and the person they used to be, and let the new ideology – say, atheism, or even feminism, stop defining them. Heroine’s journey can very much apply to men, it’s an internal struggle as much as external, but it’s a bit more applicable to women in the context of a story. As for your original questions, the thing is, “feminine” and “masculine” traits alone are usually not enough, and don’t add up to a completely rounded human being – hence the reconciliation. Why should a warrior not be allowed human softness underneath, male or female? Why should a woman always shrink in perfect display of what the society calls feminine? It doesn’t add up, and messes people up a lot. Huh! I was using the Heroine’s journey all along and I didn’t even know it. Cool. And even though we just saw the stages of Mara’s journey, I would still love to read it in full. Just completed the action-adventure video game, Hellblade : Senua`s Sacrifice ! It generally follows the stages of the Heroines Journey very closely, and no I am not trying to advertise, but the game is highly recommended as an example of the heroines journey. But it is not for the faint-hearted : Very graphic and disturbing images of extreme violence and nightmarish scenes and content ! The game is both a tragic/epic tale and at the same time meant as a metaphorical presentation of the protagonist struggle with mental illness. Often very unpleasant, but also often beautiful images as well as a highly emotional story, as the heroine descends deeper into hel, the realm of the dead from Nordic mythology, and deeper into her own madness, and unlocks clues to her background story and the reasons for her mental troubles. Has good examples of most of the stages in Heroines Journey ! I’m amazed how well this fits the journey of the heroine in the story I’m working on. Beautiful. There was an interesting take on this in The Lego Movie: The Second Part, in which Emmet goes through something like this. It was a rare case in which a male character was the one to go through this sort of arc. I also found that the conflict being between siblings fighting over Legos was actually a vastly more interesting one than the previous movie because it was far more accurate.